Sutton Rovers lifted the Tom Sandys Trophy after beating East Lincs Combination rivals Louth Old Boys Reds, 6-2, in the final. 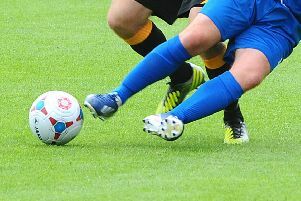 By half-time, Sutton were 3-0 up thanks to goals from Mitch Whiley and Ryan Worrall’s double and Mitch Whiley’s strike. In the second half, Louth piled on the pressure as a change of formation put Sutton under some intense pressure. On a hot day, thing got tougher for Sutton when Cam Ward was shown a straight red for violent conduct, and Louth, now with their tails up, scored twice in quick succession. Rovers were under the cosh, but their quick build-up and raw pace saw Worrall square the ball for Riley Hall who finished in an empty net. Sutton were now cruising and 10 minutes from time, Whiley’s brilliant chipped through ball allowed Worrall to lob the on-rushing keeper to complete his hat-trick. Man-of-the-match was awarded to captain Adam Henshall. Manager Rob Bedford said: “This was a very good result and our best performance all season. “We dominated from the off and showed character when going down to 10 men and conceding two quick goals. The club wishes to thank their sponsors Mablethorpe Seal Sanctuary, and Seacroft Ford.